Recently, Microsoft released a new Insider build 15002 for Fast Ring members. The latest build comes with many feature and improvements. Hyper-V also received some of these improvements for Windows 10 users. Hyper-V Manager in build 15002 brings a new single-page wizard that makes it faster and easier to create virtual machines. You can access it through a new “Quick Create…” button. According to the team, Quick Create focuses on getting the guest operating system up and running. It automatically creates virtual hardware necessary to run the guest operating system, including a virtual switch. 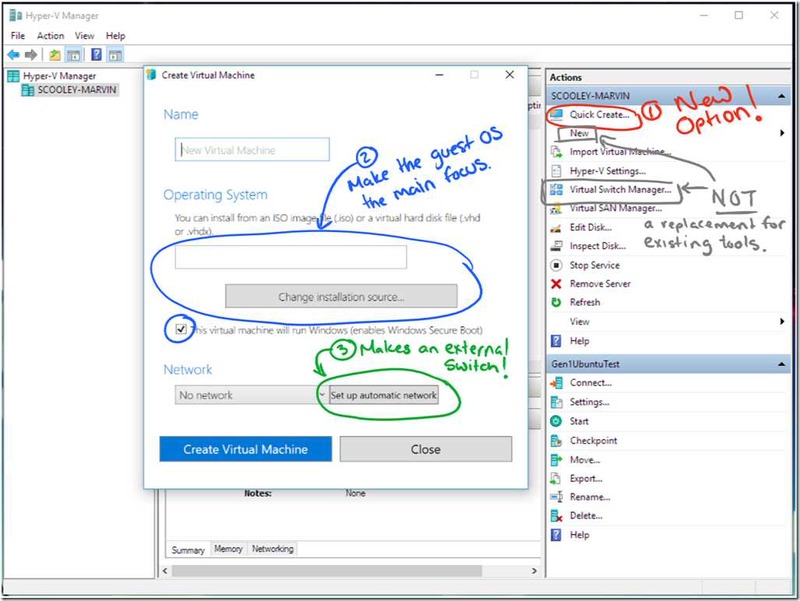 There is also a new option to create an external switch directly to the new virtual machine experience. With build 15002, Hyper-V on Windows 10 allocates memory for starting virtual machines. In the past, when you started a virtual machine, Hyper-V allocated memory very conservatively. Conservative memory allocation is useful in a hosting environment where not many applications run on the Hyper-V host. Now Hyper-V starts allocating memory in small chunks and will use all available memory. Now the amount of memory shown in task manager accurately reflects the amount available for starting virtual machines.